Best Kids App in more than 50 countries! Winner of a NAPPA Gold Award! “Pretty, fun and rich. It gives a great overview of what cooking is” A Dr. Panda fan. Dr. Panda’s Restaurant is re-opening, and this time all the choices are yours! Make the pizza of your dreams, a pasta dish to rave about, or a soup so spicy your customers will breathe fire! Sweet or salty? Spicy or bitter? It’s up to you! 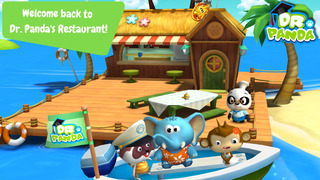 Kids can take charge in their own kitchen in Dr. Panda’s Restaurant 2! Future fine chefs have the freedom to choose what they want to prepare and exactly how they’d like to prepare it! Chop, grate, blend, fry and more with over 20 ingredients and create the perfect (or perfectly disgusting!) dish! Feed them to your customers and pay attention to how they react–it’ll be different every time! In Dr. Panda’s Restaurant 2 you can be a master chef, so get cooking! •Choose from over 20 ingredients: Fish, kiwifruit, eggs, peppers, tomatoes and more! •Chop, bake, boil, fry and more to make the perfect dish! •Experiment and have fun! No time limits or scoring. •Check out how customers react to what you use and how you cook! Dozens of different reactions to see! •Safe for kids! Absolutely no third-party ads! •Learn the basic steps of making all sorts of different foods! •Get familiar with how different recipes and kitchen tools work! •Pick up on facial cues and choose what things customers want to eat! Download Dr. Panda’s Restaurant 2 NOW and start cooking! Dr. Panda is a kids game series developed by TribePlay. We develop games with educational values that help kids understand life and the world around them. If you have any questions on how we design games for kids feel free to contact us. Just drop an email to s[email protected] or contact us via Facebook facebook.com/drpandagames or Twitter https://twitter.com/drpandagames. – Sushi recipe added to Dr. Panda’s menu! Now you can make the perfect sushi rolls using whatever ingredients you’d like! What kind of sushi will you make? – Now optimized for iOS8! Follow Me for Instagram - Get more REAL followers and search by location!